In the world of medical and diagnostic imaging, medical professionals have a wide range of tools at their disposal to provide the best possible services to their patients. You have a variety of different methods available that can look inside the human body for a wide range of reasons. As Pittsburgh’s imaging service experts, our practice is here to provide affordable medical imaging to patients all across Pennsylvania. North Pittsburgh Imaging Specialists has proudly served as your team of ACR board-certified radiologists, delivering quality services and professional support to deliver a higher level of personal care. Medical imaging is a beneficial services that can help you for any number of reasons, and our trained staff and top-notch equipment is here to get the job done. While our diagnostic imaging is done to produce a still picture of your body, services such as a fluoroscopy provide radiologists and patients with a live feed of moving structures within the body. Today, we’ll highlight a few reasons why you may require a fluoroscopy, as well as the benefit that our professional imaging experts can provide your medical plan. Biopsies. Fluoroscopy can be used as a cost-effective alternative to MRIs and CT scans, delivering precise locations when using a biopsy needle for accurate results. Locating foreign bodies. Finding and removing a foreign body can be very challenging with traditional imaging services. Fluoroscopic practices can help to provide a clear, moving picture of the body, helping radiologists to pinpoint the location of foreign bodies in three dimensions. Spine and joint injections. Removing small volumes of cerebrospinal fluid or injecting medications and other agents into the lumbar cistern of your spine can be made easier with the use of fluoroscopy. Placement of intravenous catheters. Accuracy is needed when inserting IVs into veins, and fluoroscopy can prove very helpful in providing a clear and precise location of your veins and arteries. Why Would I Need Fluoroscopy? Arthrography. Being able to clearly view the joints in your body can be difficult, yet this approach helps by providing a moving picture of how your joint operates. This can also be useful for anesthetic injections and other procedures where precise placement within the joints is necessary. Barium X-Rays. In this process, barium is introduced into the body to give medical professionals a clear picture of this chemical as it moves through the intestines. Fluoroscopy is helpful here for giving doctors the ability to move their patients to provide a precise image of the problem in question. 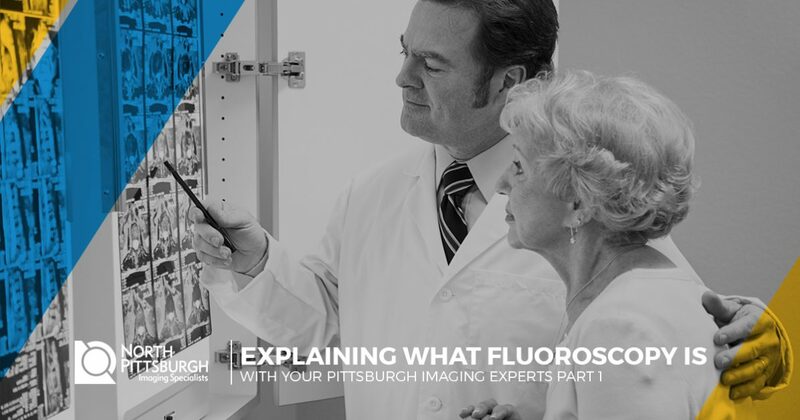 Next time, we’ll continue this blog by discussing a few more uses for fluoroscopy. If you’re in need of imaging services in Pittsburgh, be sure to reach out to our practice to receive accurate and affordable imaging. North Pittsburgh Imaging Specialists is proud to be your source for comprehensive imaging support at an affordable price. Contact us today to learn more!